Here at our homestead we don’t use many disposable items. Paper towels were eliminated years ago and we simply use washable rags instead. Paper plates certainly have their uses and we use them from time to time when it makes sense. But even for a moderately-large gathering my preference is to use real dishes. I’ve written about how we’ve kept our landfill-bound trash down to a bare minimum with the elimination of most disposable goods and utilizing both composting and recycling. But what about repurposing? There are items that have lived past their current uses that can still be used for other purposes before they hit the trash. Glass jars almost always receive a second life around the ranch, primarily the wide-mouth ones. There are many pantry uses for them of course. But the most beneficial second use for them for us is for storing leftovers. (I previously wrote about Using Glass In Our Refrigerator) Almost all of my leftovers are placed in the fridge in these glass jars. Since they are see through we don’t fret over something delicious being moved further and further to the back of the fridge until it grows into a science experiment gone wrong! Since I didn’t have to buy the containers (they were saved for me by family members) I’ve saved money on both the storage as well as the food itself by not allowing it to go to waste. Here’s another jar example, this time plastic jars. You see, RancherMan LOVES peanut butter. And for us it almost always comes in a plastic screw-top jar. Once the last of the peanut butter has been scraped from the jar, then what? Well the label is removed and the jar is washed before it goes on to its second purpose. I use these handy peanut butter jars in the freezer to hold my own homemade broth. Since making broth is ridiculously easy, inexpensive and healthier to make I try to have my own broth handy at all times. After making my broth I simply allow it to cool, skim the fat and pour the cooled broth into these jars (leaving proper freezing expansion head space). Then I label the top of the jar with duct tape and a sharpie & pop it into the freezer. Although I’m not a big fan of plastic, I’ve never been successful storing glass in the freezer. So until a better option presents itself this still saves me tons of money on broth. I also use these handy plastic peanut-butter jars to freeze homemade Ranch-Style Beans after I’ve cooked a big pot of them. When I’m ready to use them I just pull them out of the freezer and place in the fridge the night before I need them. They thaw overnight. That way delicious and homemade food is ready to pour into a microwave-safe container, heat and complete my meal in a hurry. And there’s precious little landfill fodder leaving this house because of it. After they’ve served their time as a peanut butter container and then a freezer container there’s yet another use for them. My city-raised grandbabies love to catch bugs with them. I had Rancher-Man drill holes in the top of different colored lids and I scrolled each grandbaby’s name on a lid with a permanent marker. Now they have non-breakable containers to catch ladybugs. It’s guaranteed to provide hours of country fun for them. I’m always surprised at the things kids latch onto sometimes but this is always the first thing they reach for when they visit. And they spend hours running around making their own ladybug playland. Since they all have their names on their own jar there’s no hard feelings that one of their cousins has the wrong jar. This is by far my favorite use for these jars! And lastly let’s talk about socks. Working on a ranch we are pretty hard on socks and go through them pretty fast. What to do with them when they are no longer useful for socks? This one is easy: After a too-far-gone sock is clean I cut it into a large square and use it for various other cleaning tasks. I’ll cut off the toe and heel and split the remaining band in half for a square-ish piece of very absorbent terrycloth fabric that can be used to clean, oftentimes in the place of paper towels. We just throw them in the regular wash and reuse them for quite a while. When these rags have put in hard labor as cleaning cloths and become overly stained I shift them to garage duty for their final use. 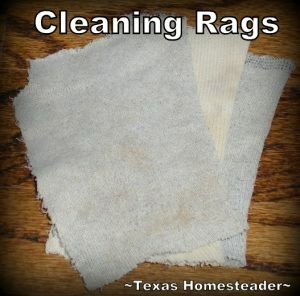 There RancherMan uses them with his grease gun or to wipe down something incredibly grimy. They finally hit the trash after he’s through with them. That’s quite a few extra uses for a simple sock! What do you like to repurpose before it hits the trash? 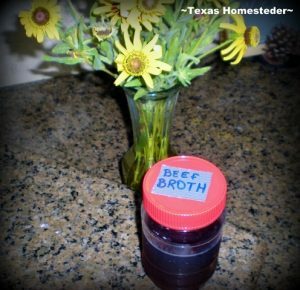 This entry was posted in Blog Posts and tagged Cooking, Environment, Frugality on August 11, 2013 by Texas Homesteader. We haven’t gone through our current tub of peanut butter, but when I do, I’mg going to keep it rather than recycle it. Thanks for posting on the #WasteLessWednesday blog hop. I was born and raised in East Texas and had farm/ranch experience before moving to San Diego over fifty years ago. I have been doing nearly all of the suggestions that others are doing. Yes, you can live like you are in the country when you live in the city. My peanut butter jars hold nut, bolts, nails, etc. for my home projects and in my sewing room, bobbins, bits of ribbon, buttons, etc. for sewing. I compost, use virtually no paper products or plastic. On my fridge is a sign that reads: Please do not discard anything which may be reused, recycled, or composted. I THANK YOU, MOTHER EARTH THANKS YOU. Great use for all the peanut butter jars! Thanks for sharing with Simply Natural Saturdays. I suppose there’s a little bit of hoarder in me, but there are so many things I hate to throw away. It’s nice to see your suggestions for using some of them. Have a great week in the Lord! This is a great post and was the Most Viewed last week and will be featured!! Thanks for sharing on My 2 Favorite Things on Thursday!! Pinned! We also use “bug jars” with our old plastic containers. We also give away caterpillars on CL, so for folks who forget to bring a jar, we always have some handy. I just posted about our homemade room A/C unit, made from mostly repurposed items. When using jars for the freezer, stop filling when the contents are about an inch and a half from the shoulder (the inward curve) of the jar. When good freezes it expands and moves up the inside of the jar. The top is one of the places it freezes first. When that top reaches the shoulder it can’t bend or reposition to make the curve so the pressure breaks the glass. You can also buy FREEZER jars. They come in one and a half pint size and down. I don’t trust ANY plastic!! Heated or frozen. Plastics are a by products of petro chemicals. Would you put motor oil or gasoline on your food? Love the post. We also reuse materials before they are recycled. Glass jars are my favorite. We like to use them to send leftovers home with dinner guests in addition to using them as storage. Great ideas in this post! My husband loves queso dip and it comes in a great sized glass jar. I use them for storing leftovers and herbs. Sometimes I even re-paint the tops with spray paint and make them pretty! Thanks for posting on Front Porch Friday. Great post! I have been using my plastic peanut butter jars to hold my dried beans and homemade pasta! I haven’t had any problems storing glass jars in the freezer, but I do like the idea of storing broth in the plastic jars also! Thanks for all these great tips. I always wash out our glass jars to house leftovers & such. One currently has lacto-fermented garlic inside 🙂 I never thought to use the plastic ones, though. Great idea on using them to store broth! I can definitely get on board with that!! This is a great post! I reuse glass jars over and over for lots of things (I had a post about that last month). I love having them around. I’m not too fond of plastic, but haven’t found a substitute for zip-top bags. I always wash these out and reuse them, unless they have had raw meat in them. They get used until they spring a leak or get torn up. I love your sock idea! With 9 people in our house, socks are always a not-so-exciting part of laundry, and we are forever with spare socks. Thanks for your great tips. I know what to do with those lonely ones now. Thanks for sharing at Wake Up Wednesday! Just found your site & am very excited about it. Oh–what to repurpose next. Socks have so many uses around here. A few favorites–tie into a chain & use a dog tug rags; tie garden plants to trellises (& those used ones will become garden weed barrier thanks to the post above); tie up a coiled ext cord when storing, they untie & retie easily too; use mitt style with warm water & a tiny bit of tree tea oil to clean pet ears; mitt style for dassh boards, “floss” between house radiator, freezer coils & the like; fill with stones for weighing down tarps; place thin pantyhose over vacuum when vacuuming blindly or looking for something small. But my new fav thing to re purpose are dog food bags into totes. Cut a 2″ strip from the top, fold the bag in on itself & duct tape a bottom seam, use the strip to make a handle, secure handle by using nut, bolts & washer (to prevent pull through)–when the bag is worn be sure to salvage the hardware. My main use is for food shopping bags but I use them to tote just about anything, they especially good for wet things. Thanx for listening. That’s genius! I get so annoyed by oily bottles and shelves! Thanks for sharing!! So simple! I think one of the best tips I ever found was to save all the odds and ends and peelings of the fresh vegetables I use into a gallon size freezer bag and freeze them. When the bag is full I dump half into the crockpot, cover with water, and cook it until I have time to strain it out. The solids go into the compost, the veggie broth is labeled and stored. Hubbs came home last night and said “mm, something smells really good, babe!” and I had to laugh as it was just the latest pot of broth, not supper itself! I recently lost several glass jars to the freezer, so I’ll be saving the PB jars for broth as well! After that, they head to Hubb’s shop for collecting small bits and things. I save cracker wrappers, cereal wrappers and the like to rewrap small bits of food (same for the celery rubber band) or a sandwich. the wrappers also come in handy to put in my container for home made bread as it keeps it fresher for another day or two longer. Love the idea of using the wide-mouth jars for leftovers. We buy Corning Ware and Pyrex at thrift stores for the same thing. I have two large plastic coffee containers (found in neighbors’ recycle bins). One is used for coffee grounds and eggshells and the other is kept in our freezer as a makeshift compost bucket. Both are emptied into the garden when full. Daisy–love the idea of freezing the compost items until they can be walked out the the pile. The freezing will also expedite the breakdown–genius! I LOVE the glass jars (wide mouth especially) for leftovers. I’ve managed to reduce our food waste to about 1% with this simple trick. Jars, old t-shirts, socks, dishes, most anything can be repurposed somehow. 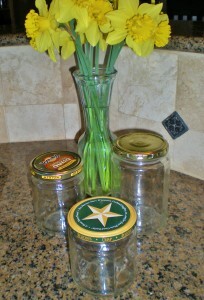 I love your ideas for peanut butter jars – I have a thing about repurposing plastic containers! My favorite thing to repurpose is my husband’s coffee containers – he drinks lots and lots of coffee and those wonderful containers just need a little help to look beautiful and then organize your kitchen, your child’s room, a teacher’s room – the bathroom – gosh, just about anything! I love your sock tips; I need to try those. Thanks for sharing your tips at Fabulously Frugal Thursday! Reusing stuff is a definite must in this day and age! We recycle all our old clothes while they’re still in good nick by donating them to charity, same too with books and any household stuff. In general, we just try not to buy a lot of things and we plan our weekly meals carefully so there’s no wastage and things thrown out. My best recycling tip is using my kids’ drawings as wrapping paper – makes the most gorgeous and unique gift wrapping! I’m a jar saver too. I also save every plastic container such as butter bowls. They always come in handy. Why waste what you can use. You can actually get one more use out of those socks! You can use them as weed barriers! I use holey socks as cleaning cloths and dust rags. I have arthritis in my thumbs so it makes it hard to hold a cleaning cloth. Solution? Turn the sock inside out (so the terry cloth is in contact with the surface to be cleaned) and poke my hand in! Ta-Da! Anyway, after they get all gross from repeated cleaning use and washing I cut them so that they’re a flatish square and cut out a small hole in the middle, place it on the ground, then plant seeds in the hole! I’ve done this with my tomatoes for several years (holey t-shirts work well too) and it works beautifully!! By the next growing season they’re mostly decomposed! I’ve used my left over peanut butter jars to hold different kinds of markers and colored pencils for crafts. I was thinking with your grandchildren this might come in handy.